The city of Chicago will host the 2015 NFL Draft in late April, but if current conditions hold, one of the biggest stars available in the selection process won’t attend the event. 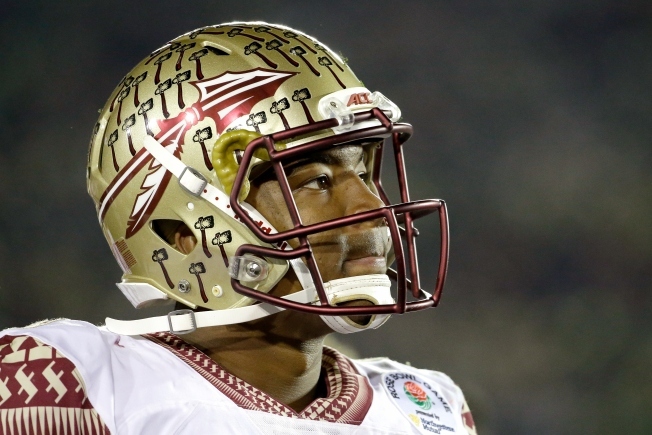 According to a tweet sent out by his attorney David Cornwell, Florida State Quarterback and potential No. 1 pick Jameis Winston deos not plan on attending the draft in Chicago, which could lead to an interesting scene if he’s selected in the top spot by the Tampa Bay Buccaneers. On one level, it makes sense for Winston not to attend the event. With all of the media hoopla that surrounds it, he will undoubtedly be asked questions about his run-ins with the law while playing for the Seminoles, and if his agents and lawyer are in his ear, they could be telling him that there’s nothing to gain from having to subject himself to that much scrutiny. On the other hand, Winston’s decision not to attend the draft could be seen in a negative light by the teams that could be looking to draft him. These questions are going to be asked whether Winston likes it or not, so avoiding the media in Chicago may not serve much purpose. At any rate, it’s Winston’s decision to make, and it will be interesting to see how NFL teams react to it if he indeed doesn’t come to the draft.